IBC & Drum Heaters: T&D International are the UK’s largest stockist and supplier of Insulated Heating Jackets for Drums & Containers. T&D International are the UK’s Specialist Distributor of Drum & IBC Heating Equipment to diverse industries including process, food and beverage, confectionery, manufacturing, chemicals, pharmaceutical and utilities – we service the international marketplace via our dedicated Exports Department. We are the UK’s largest supplier of highest performance heating jackets and systems for temperature control of bulk containers (IBC’s), storage drums, pumps, pipes, tanks and gas bottle cylinders. Specialist application heating jackets for drum and IBC containers are available including Hazardous Area certified heaters conforming to the ATEX Directive for safe use in potentially explosive atmospheres, including Zone 1 and Zone 2 – advice about storage of flammable liquids in bulk containers is covered by UK HSE HSG51. T&D provide even distribution and transfer of electric surface heat to drums and IBC’s without risk of hot or cold spots by thermostatically controlled insulated heating jackets up to 220° Celsius – heating drum and IBC contents to maintain flow and protect against frost. Low voltage heated jackets compliant with 17th Edition of SELV (Separated Extra Low Voltage) regulations are available. Intermediate bulk containers are commonly abbreviated to IBC and often referred to as IBC Totes, Tote Bins or Pallet Tanks – they are reusable industrial storage containers manufactured from plastic or composite materials. IBC’s are designed for the transport and storage of bulk liquid and granulated substances including chemicals, food ingredients, sugars, solvents, oils, waxes, cosmetics, detergents and crop science products. Hazardous class goods stored in IBC’s include general and speciality chemicals, resins, paint and inks. Leading manufacturers and types include Schutz, Ragus, Francis Ward, Pallecon, F Ward and Hoyer. T&D can deliver from stock compatible IBC heaters to suit all brands of IBC to ensure free flowing or viscous liquids, granular, powders or semi solids – including ATEX certified IBC’s heater for hazardous areas. IBC heaters are used to provide surface heating to containers storing highly viscous fluids such as sugar, sugar substitutes and sugar alcohols including Maltitol. Call T&D With Your IBC Container Heating Enquiry. Image: Schutz. Oil, chemicals, sugars, surfactants, foodstuffs and industrial process liquids become viscous at room temperature – at lower ambient or process temperatures flow resistance according to fluid thickness leads to thickening and reduced production yields. Waste increases, costs increase, Both low-viscosity and high-viscosity fluids require heating to support the smooth discharge of IBC contents from the container – without container heating the flow rate reduces further as the static head falls while the IBC empties. Drum heaters provide a controlled, safe source of electric surface heating to the drum to either maintain or raise the temperature of the drum contents – this includes heating 25L, 50L, 105L or 200L drums manufactured from steel or plastic and stored in non-hazardous or hazardous area locations. Contact T&D to discuss electrical heating for containers and drums located in potentially explosive atmospheres. See how T&D’s Drum & Container Heaters can improve your flow, reduce viscosity and maintain temperature. Insulated drum heating jackets are ideal for reducing the heat loss once a drum has been heated and for providing drum insulation to ensure frost protection. Insulated drum heating jackets can be used in conjunction with drum base heaters to provide a complete heated and insulation solution. Insulated jackets are wrapped around the outside of the drum and secured with the clips attached to the jacket. Easy to install and with custom jackets available made to order, insulated drum jackets are also waterproof and provide an extremely cost effective method of reducing thermal transfer. The jackets also feature a flap for filler access meaning the drum can still be filled with the jacket on. Manufactured from high performance polyester, the blanket insulation contained within layers of flame retardant polyester gives the heating jacket a durable and industrial feel. Jackets are manufactured with easy to fit Velcro fixing strips or easy release buckles depending on the drum size. The base drum heater uses a silicone rubber insulated mat situated underneath the base plate that sits underneath the drum to provide even surface heating to drums or containers up to 200 litres or 45 gallons. Base drum heaters are ideal for melting or reducing the viscosity of soaps, fats, wax and oil based products. The base heater can be used alone or if quicker heating is required can be used in conjunction with silicone side heaters or insulated drum jackets. In addition to providing a heat source, T&D’s base drum heaters can be used as a method of frost protection. See how T&D’s Drum Base Heaters reduce thermal loss from underneath the drum. Silicone side heaters provide even heat distribution to drums in order to avoid hot spots for containers with foodstuffs such as sugar, vegetable oil, glucose and fats. Silicone side heater bands from T&D are attached to the outside of the drum and secured with a simple spring and hook fixing. The band is manufactured from a double insulated rubber and has IP40 ingress protection. T&D silicone side drum heaters are effective and simple to use, offering exceptional performance and incorporates a capillary or electronic thermostat for precise temperature control. The heating element delivers uniform heating from accurately positioned PTFE-coated, multi-stranded resistance wires and the drum heater is manufactured to conform to the EEC low voltage and EMC directives and are CE marked accordingly. 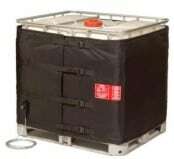 ATEX certified drum heater jackets provide gentle and controlled heating and heat retention of drums operated and stored in Zone 0, Zone 1 and Zone 2 hazardous areas. Many substances used and stored in hazardous working areas must be maintained at a process temperature and frost protected. Contact us should your facility or plant require heat tracing for frost protection of pipework or process heating of hazardous area located pipes. Hazardous locations and potentially explosive atmospheres occur in many industries and workspaces including oil and gas, petrochemical, offshore and pharmaceutical. 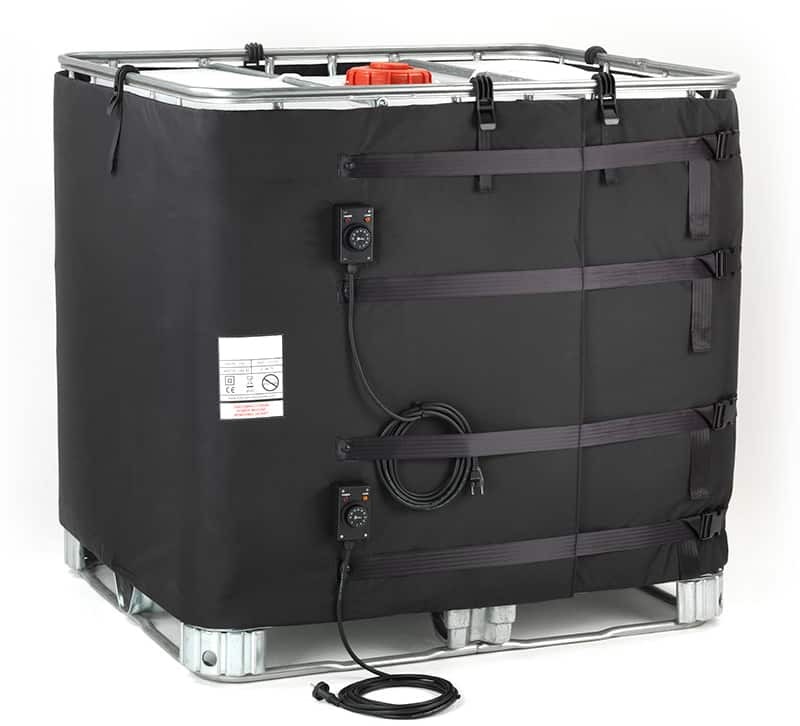 Thorne & Derrick provide a range of ATEX certified insulated heating jackets for both drums and IBCs – we can specify, design and manufacture bespoke options where required. Call T&D With Your Drum Heating Enquiry. ➡ For complete specifications, ordering details and hazardous area certifications about Drum & IBC Container Heaters please refer to the product sections below.